For serious hitters only- You wanted more speed. YOU GOT IT! can throw a 95 mph fastball and a 75 mph curveball IN ONE SET UP. The new 3-wheel design picks up where the Sidewinder left off. There are two wheels on the fastball side, like our BATA-2, and a single-wheel set up on the curveball side, like the 2005 Sidewinder. The #1 speed control dial controls the speed of the fastball, and the #2 dial controls the curveball speed for simple speed control adjustment. The height adjustments and inside/outside adjustments for the fastball and the curveball are independent of each other for ease of location adjustment. Another outstanding feature of the 2Pitch3 is the Toggle Manual Pitch Selector (sold separately). This great new feature allows you to feed fastballs and curveballs without the batter knowing which pitch is coming. When manual feeding, the T-shaped Toggle Manual Pitch Selector is set to either side. Left for a fastball. Right for a curveball. Two downhill feed chute extensions are connected to the in-feed chutes. Two balls are rolled down the feed chutes at the same time. The batter can see the balls roll down. Both balls appear (visible to the batter) just before the pitching wheels, but only one comes out. This feature makes it impossible for the batter to predict the pitch, but allows for ample timing of when the ball will be pitched. 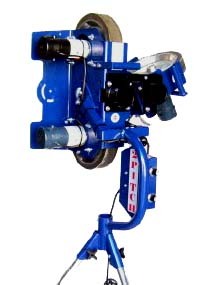 The 2Pitch3 may also be used with a BATA Auto-Feeder. The feeder may be used to feed one type of pitch, or you may use the Auto-Feeder in conjunction with our Auto-Pitch Selector. When used with the Auto-Pitch Selector, the Feeder will select either pitch at random. There is simply no better way to improve your hitting than the New 2Pitch3!